Feed The Beast (2016) : Série TV de 1 saisons et 10 épisodes diffusée sur AMC. Casting, acteurs, bandes annonces et actualités. 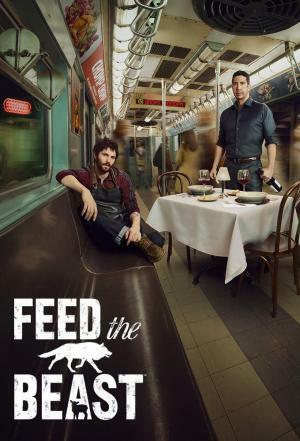 Casting de la série "Feed The Beast"
S01E01 Pilot Light 05/06/2016 In debt with the mob, Dion tries to convince Tommy to go after their dream of opening a restaurant in the Bronx. S01E02 Father of the Year 07/06/2016 Tommy and Dion court an unlikely investor, Tommy's estranged father. Meanwhile, TJ's troubles at school lead to a dangerous misunderstanding at home. S01E03 Screw You, Randy 14/06/2016 Tommy and Dion bring Thirio to life with Rie's designs, but in order to pay for it all, the guys have to resort to crime. S01E04 Secret Sauce 21/06/2016 Tommy and Dion scheme to reclaim Thirio from Aidan's arrogant chef. Meanwhile, Dion's reckless scramble to pay the Tooth Fairy puts TJ at risk. S01E05 Gimme a T 28/06/2016 Tommy struggles through Rie's birthday for the first time since her death and he ends up lashing out. S01E06 The Wild West 05/07/2016 Tommy questions Don's friendship with Rie as he revisits the past. Some uninvited guests cause trouble during the soft opening. S01E07 Tabula Rasa 12/07/2016 Dion begrudgingly seeks help from his former mentor when faced with an empty restaurant; Tommy has a shocking revelation. S01E08 In Lies the Truth 19/07/2016 Now knowing the truth about Dion's betrayal, Tommy starts to unravel. Meanwhile, the Tooth Fairy offers Dion a solution to all of his troubles. S01E09 Be My Baby 26/07/2016 TJ takes matters into his own hands when it comes to his tormentor; Tommy confronts Dion over his fears for his son. S01E10 Fire 02/08/2016 Tommy makes a bold offer to the Tooth Fairy to settle Dion's debt; TJ tries to figure out the disturbing truth of Rie's death by piecing together his memories. Envie de parler de Feed The Beast ? Les discussions sont là pour vous. Retrouvez toutes les informations sur Feed The Beast lancée en 2016 : synopsys, casting complet, acteurs, scénariste, réalisateur. Découvrez des séries similaires à regarder également. Faites vous une idée de la série grâce à la note des membres et aux critiques des internautes.